Referee Ross Dunlop says he made the right call in a controversial incident involving Portadown's Michael Gault during the Irish Cup final. The midfielder crashed to the ground after Glentoran defender Willie Garrett stepped across his path as he broke clear on goal. Dunlop waved play on and seconds later David Scullion scored the only goal to give Glentoran victory. "I was watching from behind, but there was minimal contact," said Dunlop. Garrett underhit a back-pass to keeper Elliott Morris and Gault spotted the opportunity - he went down as he attempted to pass the defender, who would have been red-carded if it was deemed a foul. "There was no question, it was a straight red card," said Ports boss Ronnie McFall after the game. "In a cup final of this importance the officials have top be up to the mark and unfortunately they were not up to it." McFall also believes his team were denied two penalties, but the Garrett-Gault incident was the major talking point. "I haven't seen it again, but my recollection of it was the players came across each other," Dunlop told the Sunday Life. "Gault appeared to go down rather easily. I spoke to my assistant on my headset and his reply was 'nothing, nothing, nothing'. 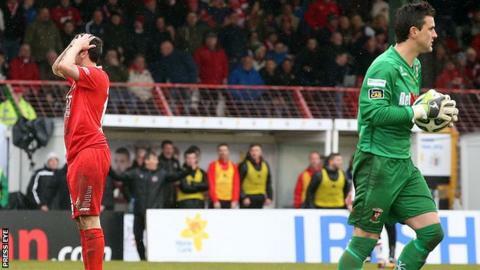 "Portadown still had enough players behind the ball but I made an honest call as I saw it. "If I've made a mistake I'll hold up my hands and apologise, but that will be no consolation to Portadown Football Club."